20 March 2015, at 9:33p.m. US - The number of pig farm samples that are confirmed positive for porcine epidemic diarrhoea virus (PEDV) in the last week was 58, two premises were confirmed with porcine deltacoronavirus (PDCoV) and one with the dual infection (PEDV and PDCoV). 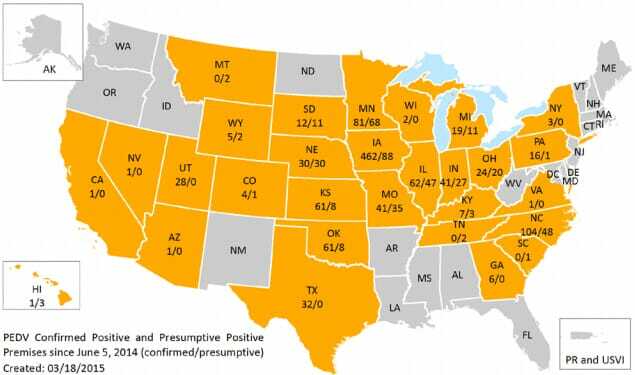 For the latest week – 8 to 14 March – there were 58 new confirmed positive premises for PEDV and none presumed positive, according to the latest report from USDA APHIS made available by the American Association of Swine Veterinarians (AASV). 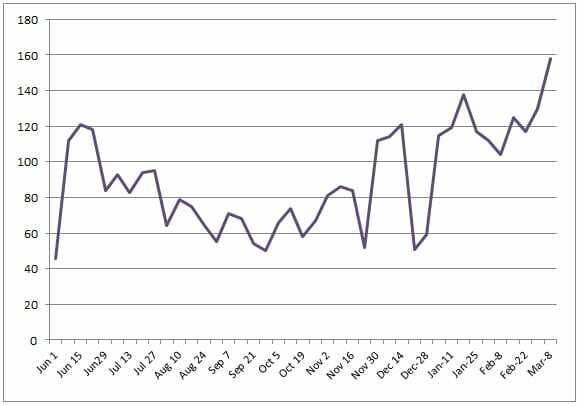 For the same period, two premises were confirmed positive for PDCoV but none was presumed positive, and there were also one confirmed dual infection (both PEDV and PDCoV) but none presumed positive. The total numbers of premises with confirmed positive status for the current week are 1,042, 47 and 44 for PEDV, PDCoV and the dual infection, respectively. 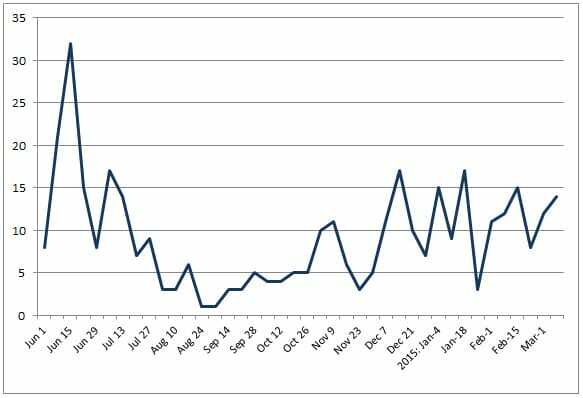 Since 5 June, for PEDV, there have been 1,106 confirmed positive premises, 416 presumed positive and 52 previously positive premises that have attained negative status. For PDCoV, the total for the same period are 53, 27 and five, respectively. For the dual infection, the totals are 46, 27 and one, respectively. There are currently 31 states with at least one confirmed positive case of PEDV. Georgia reported its first positive finding in the first week of March and has now reported six cases. For the current week (8 March), there were 158 PEDV-positive laboratory accessions, bringing the total since 5 June 2014 to 3,692. Iowa reported 54 of these new cases, North Carolina 31, Missouri 13 and Illinois 11. Also reporting positive results in this most recent week were Indiana, Kansas, Michigan, Minnesota, Nebraska, Ohio, Oklahoma, South Dakota, Texas, Utah and "unknown". There are currently 19 states with at least one confirmed positive case of PDCoV. For the current week (8 March), there were 14 PDCoV-positive laboratory accessions, bringing the total since 5 June 2014 to 368. There were four positive premises in Illinois, three each in Indiana and North Carolina, two in Michigan and one each in Iowa and Minnesota. There are currently 14 states with one or more confirmed positive cases of the dual infection with both PEDV and PDCoV. Most-affected states with the dual infection are Iowa and Minnesota, with 18 and nine confirmed positive results, respectively. APHIS has not updated the table giving the location of the new positive results this week.